Thyme is one of those multi purpose herbs that can be used in so many dishes and recipes, that growing your own is a no brainer if you love to cook. A Mediterranean herb widely used to season roast meats, stews, and a variety of other dishes, thyme adds depth and an earthy flavor to food. A surprisingly hardy perennial you can easily grow thyme at home, even if you live in cold northern climates. Thyme is a great companion plant for tomatoes, cabbage, strawberries and potatoes. 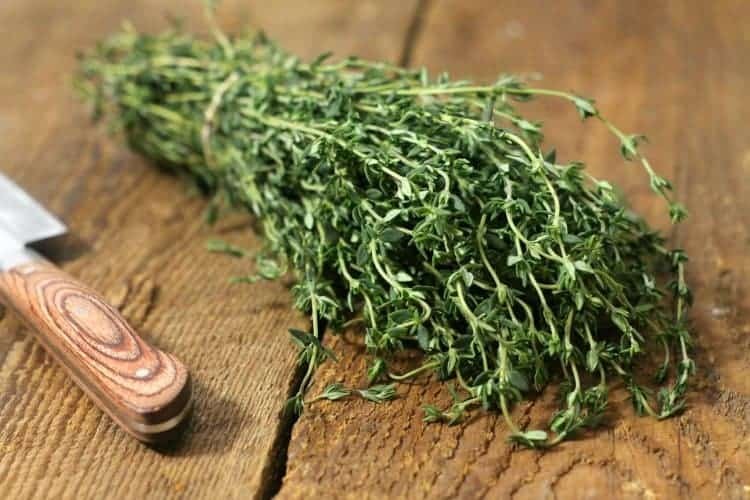 With over 150 varieties of thyme now commercially available, the most commonly used variety of thyme is Thymus vulgaris, also known as common, or garden thyme. While slow to start from seed, once established thyme is a trusty little shrub that will provide fresh herb for your kitchen for many years. Creeping thyme (Thymus praecox) – a great ground cover that boasts beautiful while, lavender, or pink flowers in the summer. Growing only 2 to 3 inches high, creeping thyme is ideal for mass planting in rock pathways and vegetable garden boarders. Variegated Lemon Thyme (Thymus x citriodorus “Variegata”) – with small yellow tipped leaves, lemon thyme is, as the name suggests, lemon scented while still delivering the traditional flavor of thyme. Use in cooking as a garnish, or to add a unique flavor to meats. Thyme is a perennial (which means it comes back year after year) and can be grown anywhere from hardiness zone 2 (-50 F) to hardiness zone 10 (30F). Most varieties of thyme are hardy up to zone 5 if provided with winter protection. If growing thyme in colder locations, you’ll likely need to bring the plant indoors for the winter. 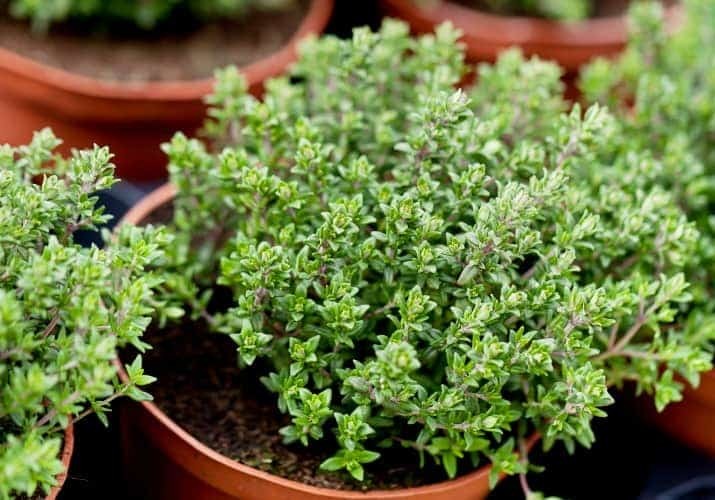 Growing thyme from seed can be hit or miss, which is why I suggest propagating thyme from cuttings taken from a friend/neighbor or purchasing a small plant. 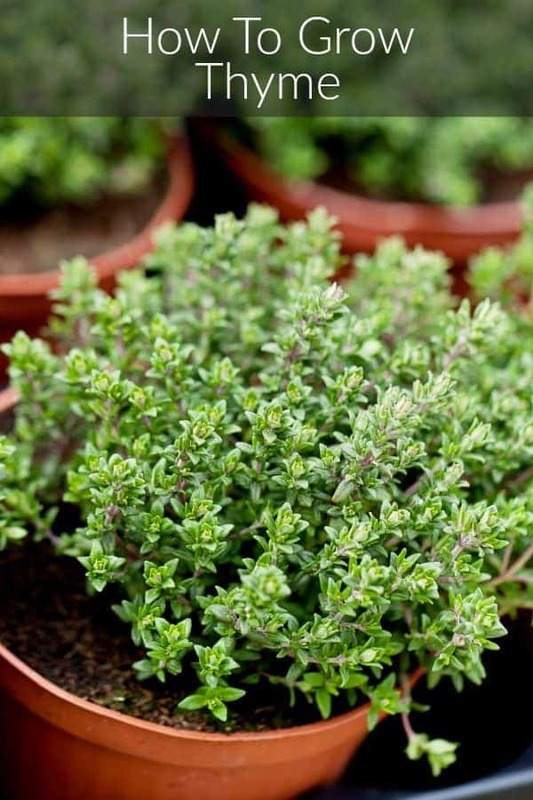 If starting thyme from seed, it’s best to start the seeds indoors 6 to 10 weeks before the last frost. The seeds are very small and don’t germinate evenly, so I would just sprinkle them over the surface of a prepared seed tray or pot. You can thin out the seedlings later. If direct sowing/planting in the garden sow the seeds by sprinkling them over a prepared section of the garden about 8 to 9 inches apart. Cover with a light layer of moist garden soil. Seeds should sprout withing 14 to 28 days. You can also plant cuttings in your garden or containers. Snip a stem of a mature plant, then remove the lower section of leaves and push the cut end directly into the soil. Plant 8 to 9 inches apart and firmly pat the soil in place, then lightly water. Keep the cutting in a warm, lightly shaded area, until you start to see new growth. Much like rosemary, parsley, and basil, thyme is well suited to growing in containers. While it will naturally not produce as well as when outside in full sun, you can easily grow thyme on your windowsill for access to fresh year round herbs. Plant the seeds or a cutting as described above, and keep the soil moist until the seeds sprout or you see new growth. Once the seeds sprout, move the thyme seedlings to a sunny window and rotate daily to encourage even growth. 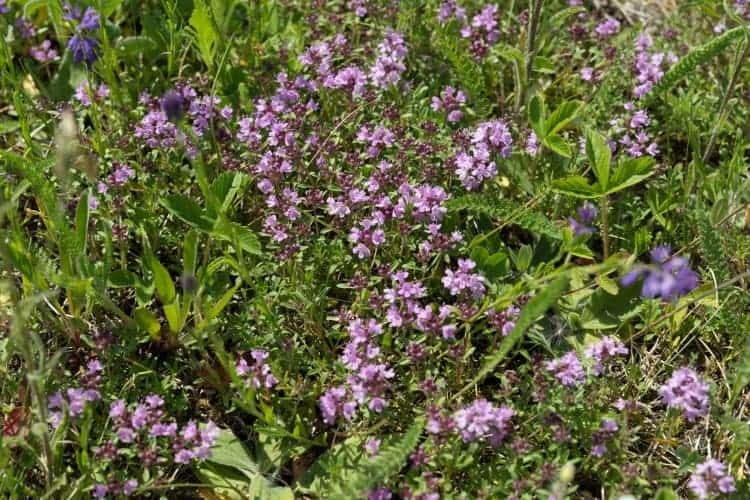 Common Thyme grows as a woody little shrub 8 – 10 inches high, with multiple little stems or ‘branches’ growing from a main stem. Thyme needs part sun to full sun (6-8 hours a day) to do well. While thyme will grow in shaded areas, it may not flower or produce as vigorously. If provided with enough sun, thyme will flower quite profusely, in small white, lavender, pink, or deep purple flowers. These tiny flowers are quite pretty, are fully edible, and can be used in salads, as a garnish, or to make tea! I love planting thyme in large flower pots because you can easily move the planter to a sunnier location as the sun shifts throughout the year or if you have a shady garden. While thyme does need moist soil, you should allow plenty of drainage and avoid over watering, especially if planting thyme in pots. If planted outdoors I only water my thyme if the summer is very hot and dry. Otherwise I let nature do its own work. If you feel your thyme is growing very slow, try fertilizing it once a month with a liquid seaweed based fertilizer such as Neptune’s Harvest. When harvesting thyme it is best to harvest from the outside in. The smaller more tender stems are milder in flavor and not as ‘woody’. 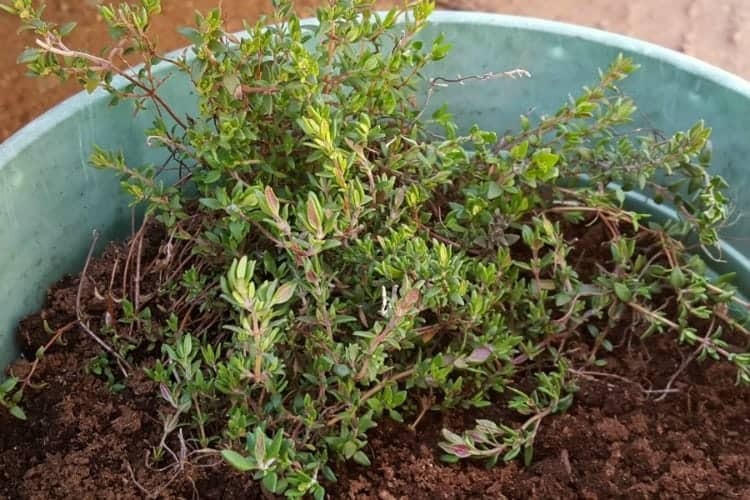 Harvest thyme when you see stems become ‘leggy’ or as needed. Snip of as many stems as you need, making sure to take no more then 1/3 of the plant at any given time. This allows the thyme to quickly grow back and fill in any sections that where harvested. While fresh thyme will always have the best flavor, you can easily preserve some of your thyme for winter by drying it, or infusing it in oil. You can also freeze it in little bags if you wish. Luckily thyme does surprisingly well in the fridge when simply kept in a little bag to prevent it from drying out. you can also wrap the cut end in a little moist paper towel to keep the thyme fresh, or keep the thyme in a little water filled glass on a window ledge. Tie little bunches of thyme into bundles and hang them upside down in a cool dry location to air dry. Once dry rub the stems with you hands to remove the dries leaves. Store the dried thyme in a mason or other glass jar to preserve its flavor. 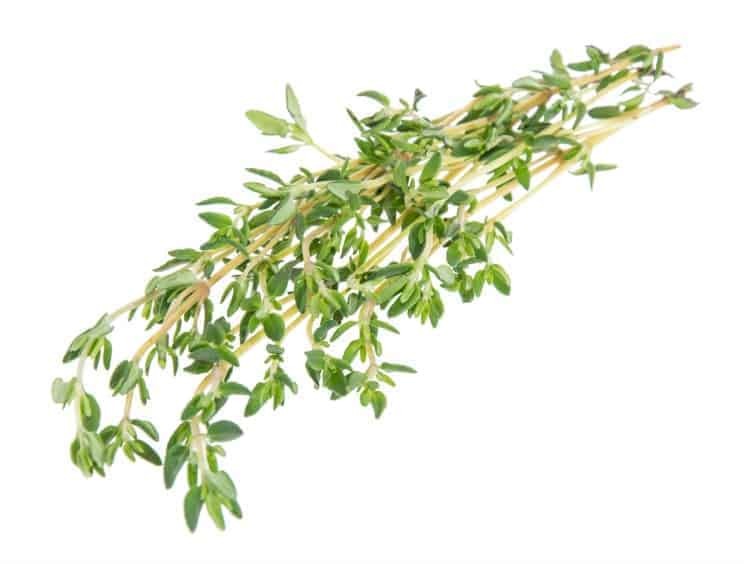 To infuse any kind of oil with thyme, Pick and wash 8 -10 large stems of thyme. Wash the herb and then pat dry to remove as much moisture as possible. Place the washed herb in an oil bottle or mason jar and cover completely with good quality olive oil. Store the sealed jar of oil in a dark location for a week, then use as needed. As mentioned earlier, thyme is a very popular herb in the kitchen, and has been used for centuries in French, Mediteranian, and Italian cooking. 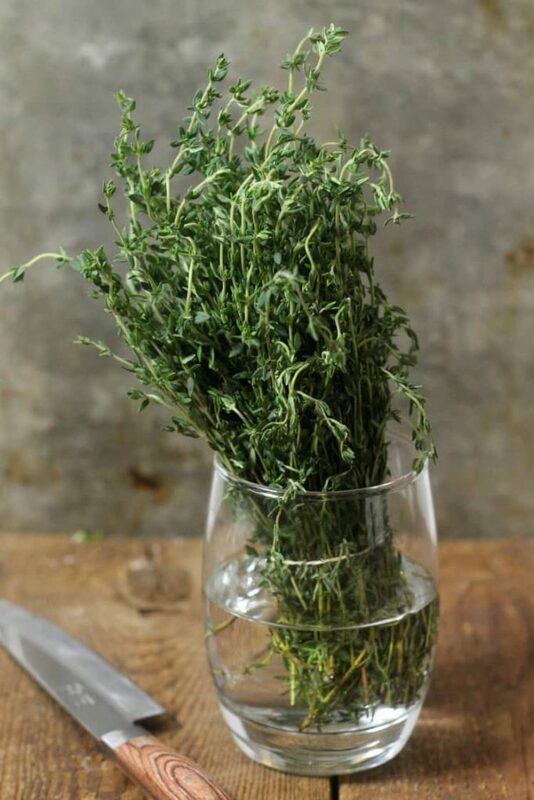 When using fresh thyme, remove the leaves from the stem by running your fingers along the plant stem from to top down. This will pull of the tiny leaves in one fell swoop and avoid having hard little bits of thyme stem caught in your teeth. If you harvested very young and tender thyme stems you may chop the whole plant, stem included. A central ingredients in Herb de Provence and bouquet garni, Thyme is central to seasoning meats, stews, and soup. 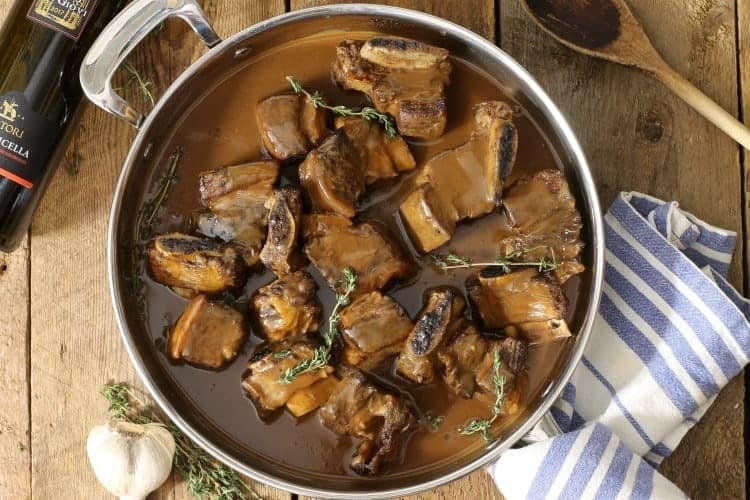 I use thyme in my braised beef short ribs, as well as in German Oxtail Soup and Instant Pot French Onion Soup. 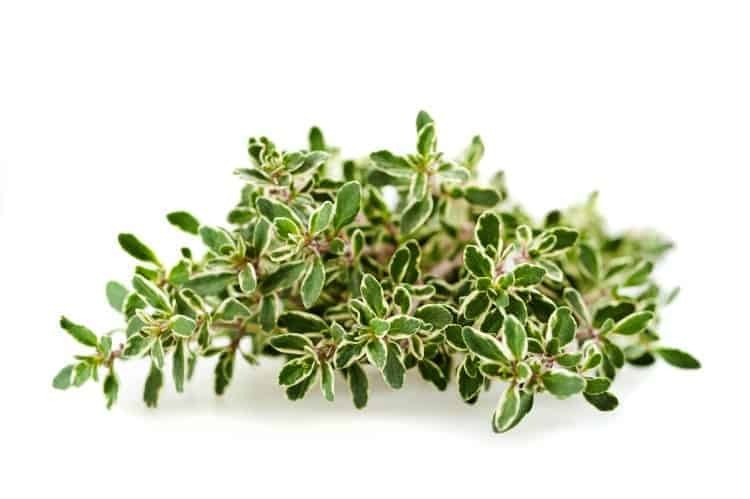 Thyme is also commonly used to flavor other dishes and recipes such as salad dressings, tomato based dishes, and pastas. 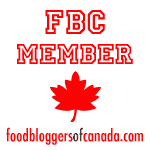 It’s used in spice mixes, dry rubs, and marinades as well. Want To Grow Even More Herbs?